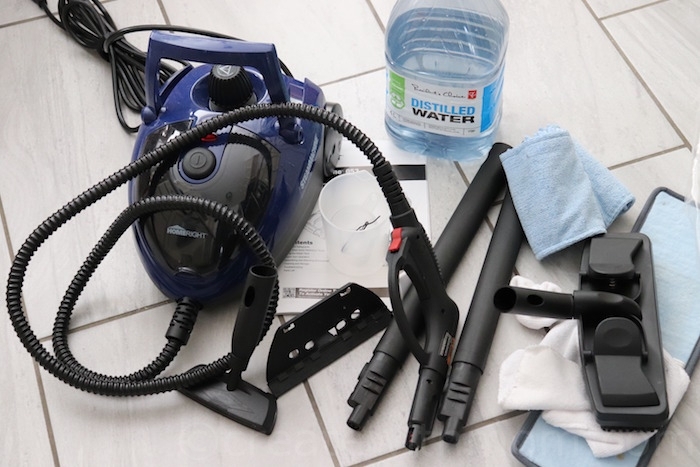 We love using the Home Right Steam Machine model O53 to clean a variety of surfaces in our home. 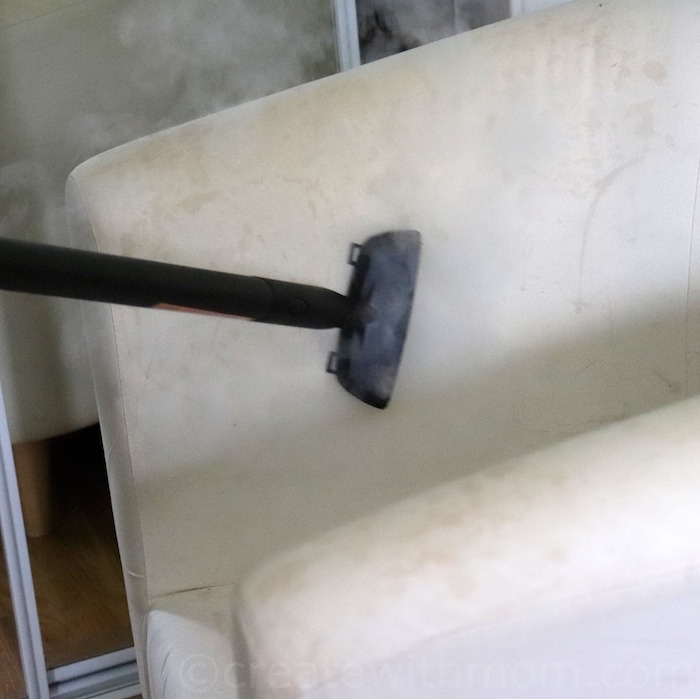 We found this to be a natural, green way to clean and sanitize our home. It is important, that when we use this machine we use it with caution, as the steam can cause injury as the water inside the unit becomes really hot. In order to avoid injury and damage to the machine, do not overfill the water as it can only hold 40 oz. of de-mineralized or distilled water. We used the included measuring cup and funnel to help us pour the water. The machine is ready when the orange steam pressure light turns off. The steaming time depends on the amount of water we pour. The kit comes with eight pieces of accessories such as squeegee, jet nozzle, utility brushes, fabric steamer, nylon brush, brass brush, large cleaning brush that we can attach to the steam nozzle and use it to clean different surfaces. 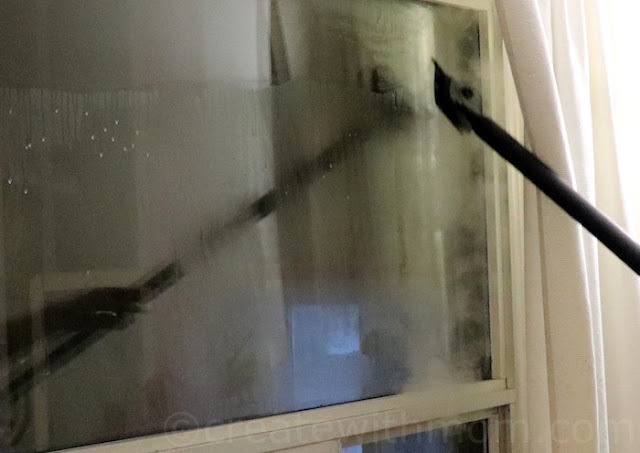 We used the squeege on our bathroom shower door, mirrors, and windows. We saw a big difference after cleaning our windows and sliding glass doors, as it worked really well to make these surfaces look new. Do not apply steam to glass surfaces cooler than 32 degrees Fahrenheit. 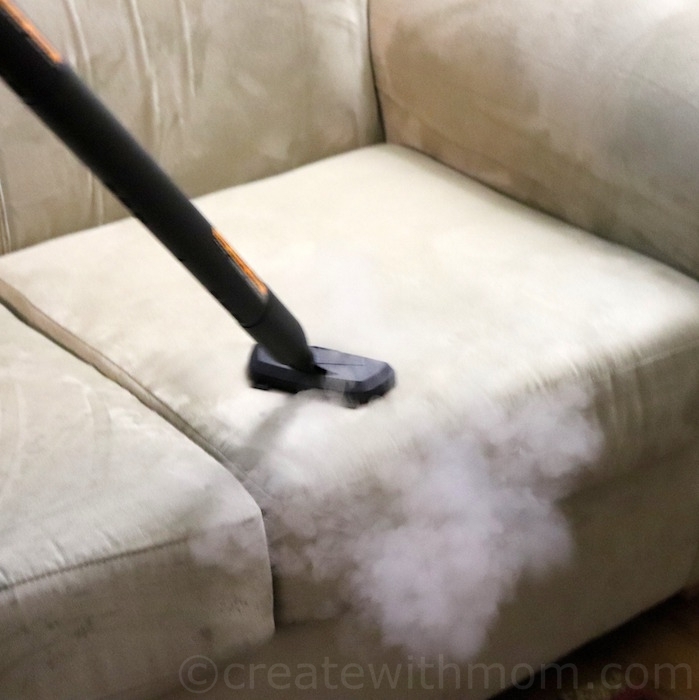 We love how well our microsuede sofa, chairs, and curtains felt after using the fabric steamer. After the steam clean, the feeling of freshness in these surfaces were very clear to everyone. The difference is best seen when the surfaces dry well. The brass brush that comes with this steamer helps remove grease and grime on grills and ovens. The large cleaning brush comes with a cleaning microfiber cloth that can be used to clean marble and granite counter tops, tiles, vinyl, and linoleum floor. The package comes with a chenille mop pad that we can use on different flooring. This machine is not to be used on leather, wax-polished furnisher or floors, synthetic fabrics, velvet, Dralon or delicate steam sensitive material. We used the jet nozzle in our bathroom fixtures to disinfect. The jet nozzle is useful in hard to reach places. The nylon brush works well around sinks and faucets. The water needs to be discarded before storing. It is important that we clean and dry the machine with the included microfiber cleaning cloth and cover the steamer with the fabric bonnet before storing in a dry location. The canister can be easily moved using two wheels. 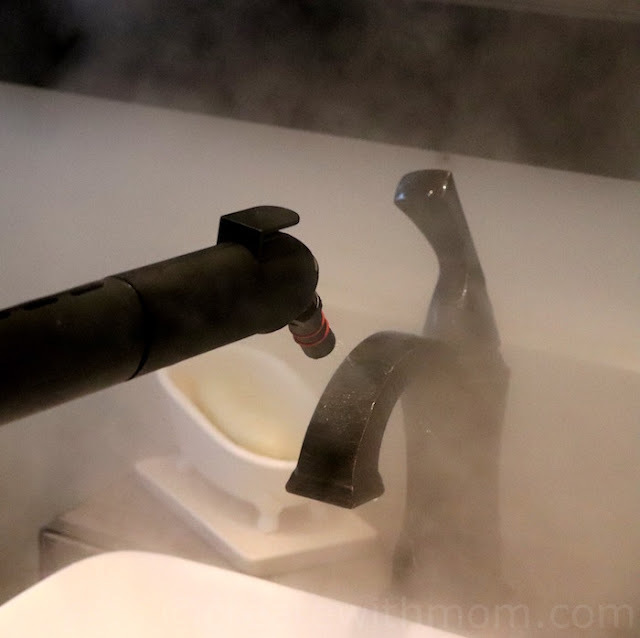 The trigger can be locked to continuous steam or off for safety. We used on different surfaces without applying anything on the surfaces and it cleaned it very well. This machine can be bought at home hardware stores and on Amazon. We love using this household chemical free multi-purpose steamer to clean many surfaces in our home to disinfect and clean floors, stovetops, ovens, grills, kitchen top, and bathroom fixtures. The pressurized high temperature steam loosens on the surface and dissolves to kill bacteria we cannot see, and removes dust mites, grease, and grime. Perfect to sanitize after spot ckeaning!